Coastal wetland habitat restoration often involves enhancement of restricted tidal flows particularly in the northeast USA. 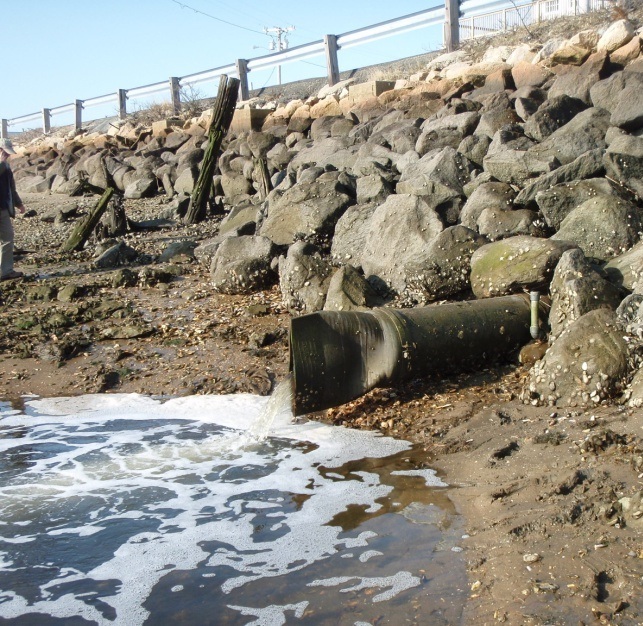 Many salt marsh habitats have been deprived of full tidal inundation with salt water as a result of roadway or other crossings (Figure 1), typically where undersized culverts or other flow control structures have been installed. On Cape Cod alone, the Cape Cod Commission identified 114 tidal restrictions for improvement (Link to Cape Cod Tidal Atlas). This is an expected result of a lack of priority on, or understanding of, the tidal flows at the time the infrastructure was constructed many decades ago. The priority may have been on installing the road with limited consideration for wetland impacts. In other cases, the flow control infrastructure was constructed as a reaction to potential storm flooding with the intent of limiting the incoming storm surge. However, in certain situations, the flow control structure also had the unintended impact of increasing flooding potential by reducing the drainage ability of the wetland system. Following large rainfall events storm water may be trapped inland and cause flooding. Figure 1. Composite Flow Control Structure (Culvert with Tide Gate). As such, there are numerous consequences related to tidal restrictions, including loss of salt marsh habitat, proliferation of invasive species, reduced access for migratory fish, reduced water quality, exacerbated upland flooding due to ponding of stormwater, and development of infrastructure within the historic marsh plain. Effects of tidal restrictions can be dramatic, as shown by Figure 2, illustrating the tidal water surface elevation up (offshore in the bay – blue line) and downstream (in the marsh – red line) from a culvert in a salt marsh. Figure 2 shows the downstream (offshore) high tide elevation reaches approximately 7 ft NAVD88; however, the tide only reaches approximately 0 ft NAVD88 upstream of the undersized culvert. In this example, there is adequate natural downstream tidal fluctuations for a healthy salt marsh, but the culvert severely restricts the flow. At certain high tides, more than 6 feet of water is prevented from flowing upstream which could benefit the marsch ecology. This example also illustrates the restricted draining that occurs during larger rainfall events. Around March 24, there was a rapid increase due to rainfall and subsequent slow decrease of water in the upstream (red) observations. It took several days for the precipitation to drain from the system. Overall, the result has been a conversion of the upstream marsh from a healthy diverse habitat with thriving salt marsh grasses, active fish nurseries, and feeding birds into a near stagnant area dominated by invasive species, such as Phragmites australis. Figure 2. Example of a tidal restriction. 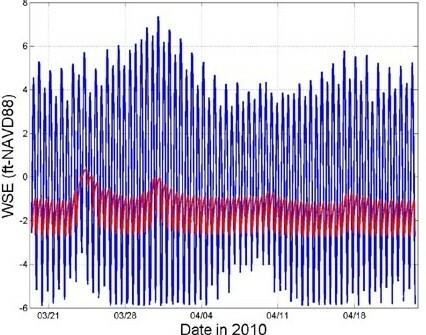 The blue water surface elevation (WSE) time series shows data downstream of the culvert, while the red water surface elevation shows data upstream of the culvert. As the state of science and computing power have improved, numerical models have become more commonplace for planning and designing coastal wetland habitat restoration projects. When properly applied, models can help to design projects to achieve restoration objectives. Objectives may include a certain number of acres restored, expanding the intertidal zone, and improving the salinity regime. Models also can be applied to improve the design of flow control structures to allow tidal waters to wet/dry the upstream marsh, while also minimizing potential upland flooding. Most available models, however, fail to incorporate the physics governing flow through structures. 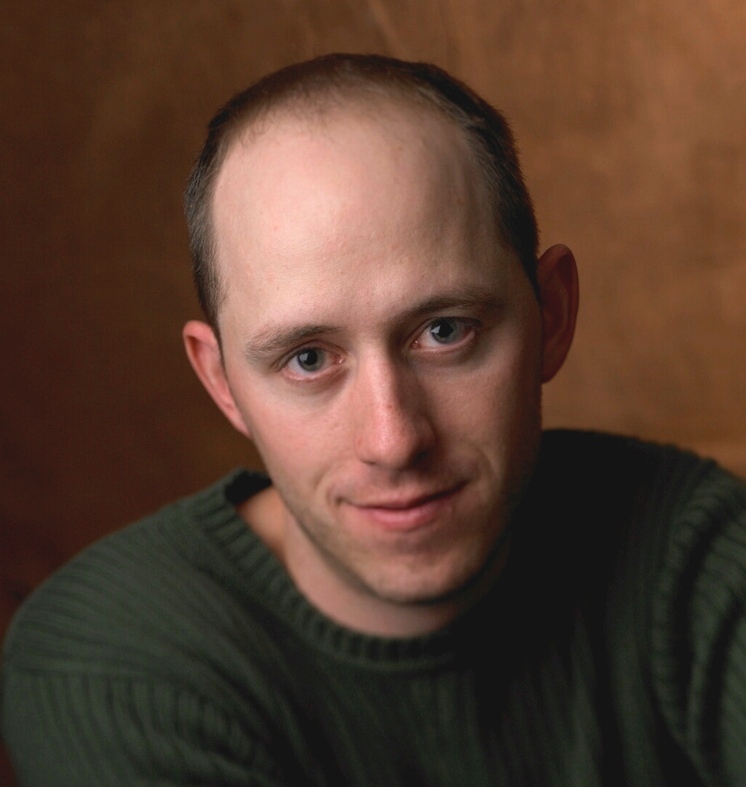 Often, existing models treat structures as open channels or simple pipe flow, depend upon limiting computational or empirical assumptions, and/or do not make calculating dynamically within the model. Woods Hole Group has developed in-house models to improve treatment of flow control structures, including complex hydraulics (e.g., sub- and supercritical flow, hydraulic jumps, flow reversals, contractions, etc.) associated with structures in a tidally forced environment. 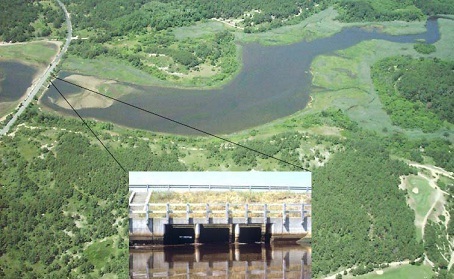 Due to the required need to manage multiple goals (e.g., improved tidal range without impacting existing infrastructure that may have been in the historic marsh plain), clients are increasingly interested in unique designs that include customized flow control structures. 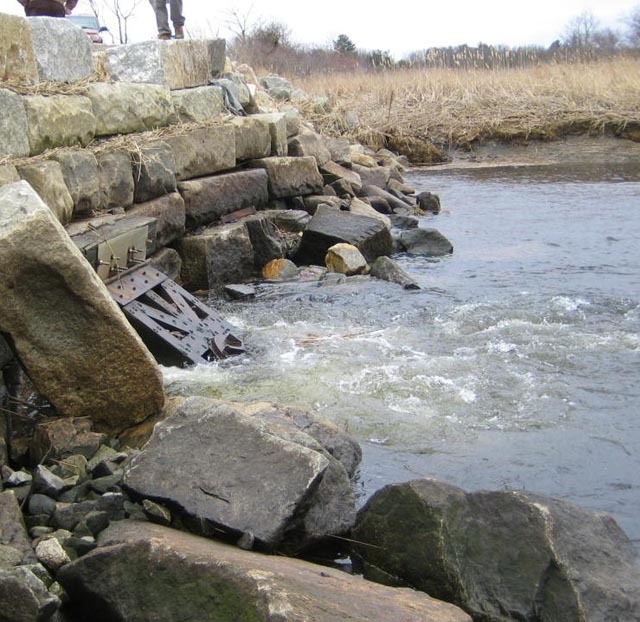 These types of structures allow for more refined restoration designs, and are more conducive to long-term adaptive management strategies to account for uncertainties in design, active storm water management, and future sea level rise response. Models for various developed structures have been calibrated to real field observations, including measurement of water surface elevation, velocity, and salinity, observed at locations where actual structures of these types are installed. Figure 3. Sample Structures that Cause Tidal Restrictions. This experience and capability allows for cost-effective assessment of a proposed restoration project prior to design and construction. Models provide the ability to assess impacts, improve management, evaluate alternatives, and accurately design proposed restoration structures and/or scenarios. Representation of the flow control structures, either existing or proposed, is usually a key component of the restoration effort, and must be determined accurately prior to developing a design and gaining the confidence of local stakeholders. As such, Woods Hole Group has developed these in-house capabilities to better serve restoration planners and managers for wetland restoration projects.